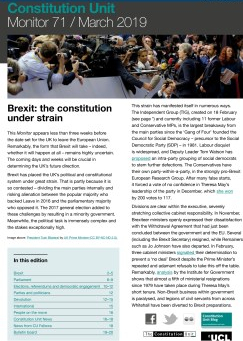 The latest issue of Monitor, the Constitution Unit’s regular newsletter, was published today. Since the last issue, the prospects of a Brexit deal occurring before March have oscillated, calls for a ‘people’s vote’ have increased in volume, and Brexit differences have led to relations between the UK government and politicians from Scotland, Wales, and Northern Ireland (still without a government) becoming increasingly strained. Allegations of a bullying culture in the House of Commons have coincided with concerns about digital campaigning and the alleged malfeasance by key players in the Brexit referendum campaign, causing concern about the state of the UK’s democracy. This post is the opening article from Monitor 70, and you can download the full issue (as well as past editions) here. Exit day – when the UK is scheduled to leave the European Union – is now little more than four months away. Yet all bets are still off as to what form it will take, or indeed whether it will even happen. This is partly because the UK–EU negotiations on a Brexit deal remain ongoing, and partly because how parliament will react to the outcome of those talks is far from clear. Just as the last Monitor went to press, and after months of delay, the government finally published a white paper in July, setting out its proposals for Brexit and the UK’s future relationship with the EU – the so-called ‘Chequers plan’. Even before publication, two key cabinet ministers – Brexit Secretary David Davis and Foreign Secretary Boris Johnson – had resigned, arguing that its proposals would bind the UK too closely to the EU yoke. Many Brexit supporters – both MPs and voters – agreed: polls found the plan’s opponents among the public outnumbered its backers by around three to one. European leaders were also critical, and finally killed off the plan at the disastrous Salzburg summit in September. Since then, UK and EU negotiators have been working frantically to resolve the crucial blocking point, regarding the Irish border (see pages 2–3). Whether the mooted November summit to sign off a deal can be resurrected will be known by the time this edition of Monitor is published. If not, agreement could potentially still be reached in December or even January. If a deal is done, its implementation will be subject to approval by the House of Commons and the passage of legislation bringing it into effect. 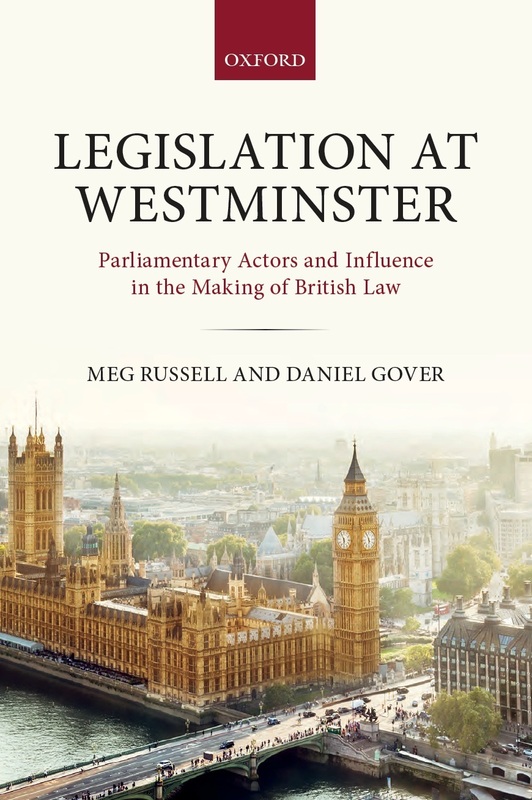 A UK in a Changing Europe report published in September (and discussed at a Unit seminar – see page 17) explained that this process is unlikely to be straightforward; since then, there has been considerable controversy over the form that parliament’s ‘meaningful vote’ might take (see pages 3–4). If no deal is done by late January, the government must set out its plans to parliament, which will (notwithstanding the legal niceties) in political reality need to determine the way ahead. This leaves four basic scenarios: a deal may or may not be done; and parliament may or may not accept this outcome. If parliament accepts either outcome, Brexit will take place on 29 March 2019 (unless the UK government and EU leaders agree a delay). If parliament rejects either outcome, the possible future directions multiply. Ministers still insist that the alternative to acceptance of their deal would be a ‘no deal’ Brexit. Given the dangers the government itself has set out, and the balance of MPs’ views, it is difficult to imagine that parliament would let this happen. Labour would push for a general election, in which it would presumably promise to negotiate a better deal. But it is difficult to see where the parliamentary votes needed to achieve this would come from. The government – perhaps following a change in Prime Minister – could seek to return to the negotiating table. But EU leaders could be reluctant to reciprocate, unless the UK signalled a substantial change of stance. Another way out of the impasse would be a further referendum. Support for such a move has grown substantially over the summer. Conservative MPs such as Justine Greening, Dominic Grieve, and Sarah Wollaston have backed the idea. Labour, following strong grassroots pressure and tense negotiations at its September conference, now officially remains open to such a vote. In October, the largest demonstration since 2003 saw (according to organisers) approaching 700,000 people march through London to demand one. 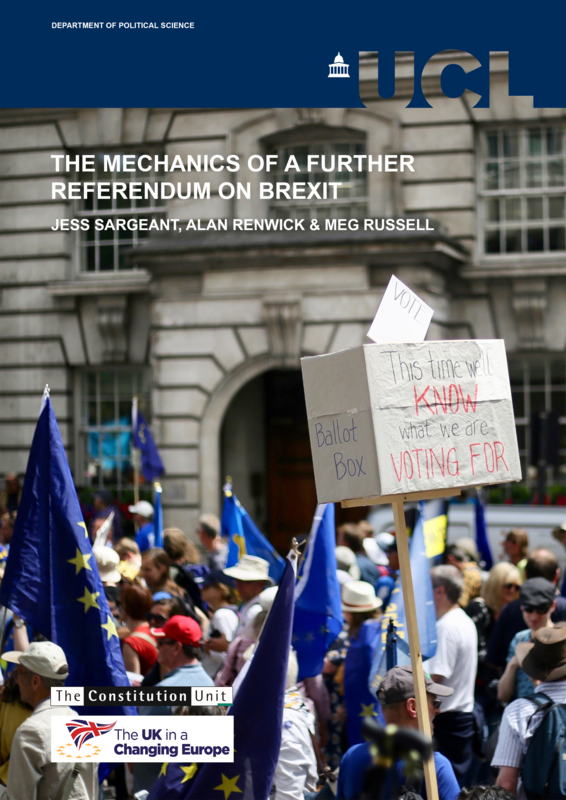 Reflecting this rising interest, the Constitution Unit published a report in October on the mechanics of a further Brexit referendum, written by Jess Sargeant, Alan Renwick and Meg Russell. 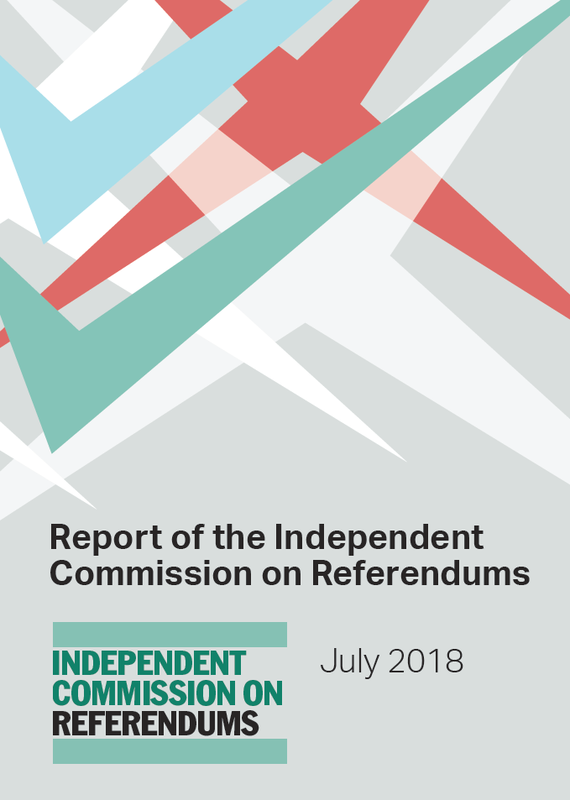 Without taking a view on whether a referendum would be desirable, the report examined how one could come about and what form it might take (see page 17). It emphasised that, while organising a referendum properly would require an extension to the Article 50 period, EU leaders would almost certainly grant this. A referendum in spring would be possible if MPs moved quickly. One crucial issue to resolve is what the question should be – a vote excluding the option to remain in the EU from the ballot paper seems inconceivable given its proponents, but this could be pitted against any deal that is done, or against leaving without a deal, or potentially against both. Alongside this, parliamentarians would need also to address some of the shortcomings in existing referendum legislation that were revealed by the 2016 vote: for example, around the regulation of digital campaigning. UK politics has been shaken to the core by Brexit. Deep social divisions have been laid bare and deepened. The Union among the UK’s constituent nations has been tested to the limits (see page 4–5). The capacities of Whitehall and Westminster have been stretched to breaking point. None of the paths that could be taken over the coming months will heal these divisions or lessen these difficulties, at least in the short term. 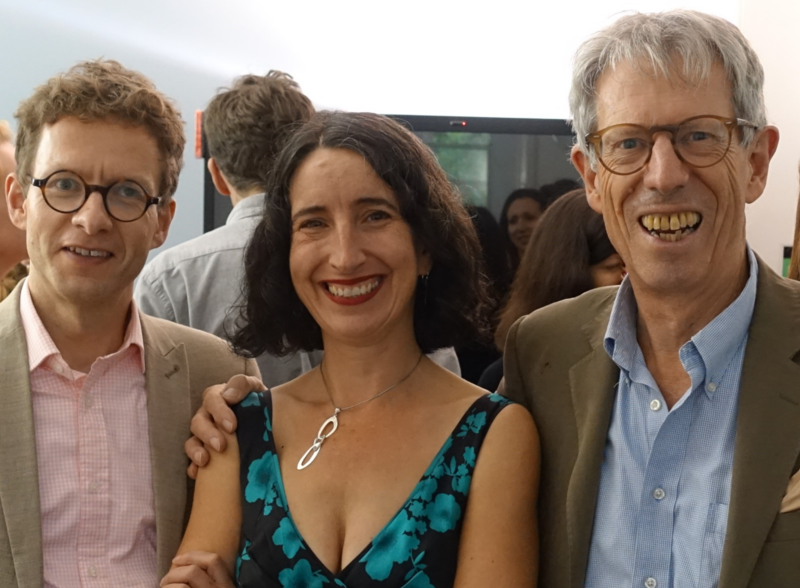 Meanwhile, other challenges – including those posed to democracy by the digital revolution (see pages 9–10) – demand urgent attention, but risk neglect. Politics and the constitution will change fundamentally in the coming months, but the character of these changes remains impossible to know. This entry was posted in Brexit, Devolution, digital democracy, Elections and referendums, Europe, Events, Freedom of information, Government, International, Judiciary and human rights, Parliament, Parties and politicians, Public Engagement and Policy Making and tagged boris johnson, Brexit, Brexit endgame, Brexit negotiations, Brexit talks, Brexit white paper, Chequers Agreement, Chequers plan, David Davis, Dominic Grieve, exit day, Irish backstop, Irish border, Justine Greening, Labour party conference, meaningful vote, Monitor, Monitor 70, no deal, no deal Brexit, Northern Ireland, Northern Ireland backstop, Salzburg European Council, Salzburg summit, Sarah Wollaston, UK in a Changing Europe. Bookmark the permalink.